For more than 20 years, the Scottish west coast port of Ullapool was one of the busiest landing centres in the UK on a seasonal basis. 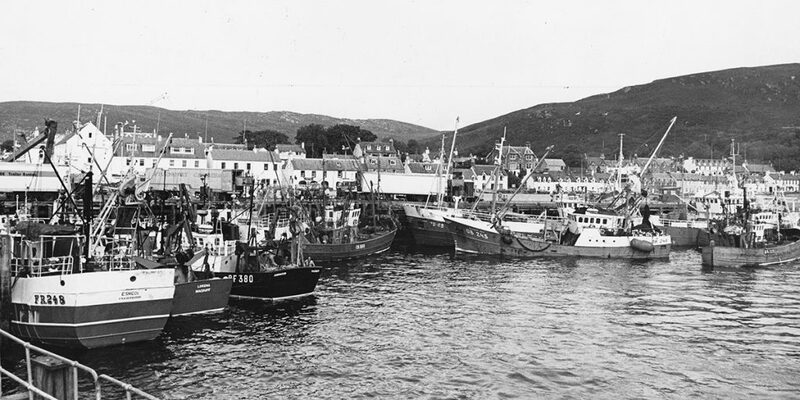 Ullapool’s rise to prominence coincided with the growth of mackerel fishing, when a large fleet of midwater trawlers and purse-seiners, faced with the need to find an alternative to the previously all-important herring fishery, started to fish large quantities of mackerel in the Minch north to Rona, Whiten Head and beyond. 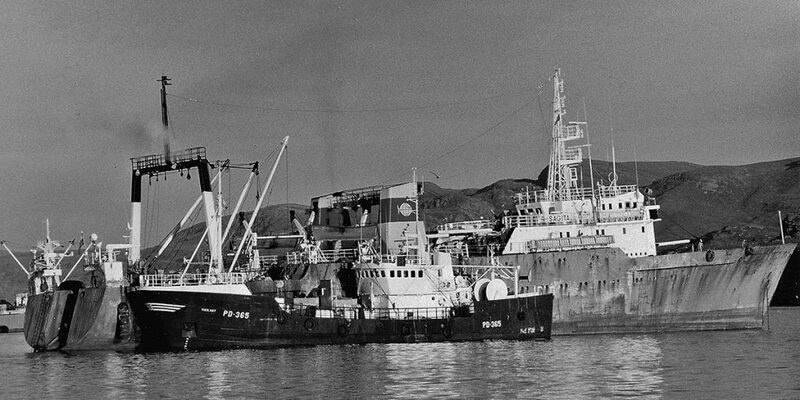 With comparatively deep water quayside berthing, and situated between Loch Broom and Annat Bay, Ullapool offered a number of natural advantages that were relatively well-suited to the requirements of midwater boats, which at this time were heavily dependent on landing their catches to much bigger klondyking vessels from Eastern Europe and Russia. 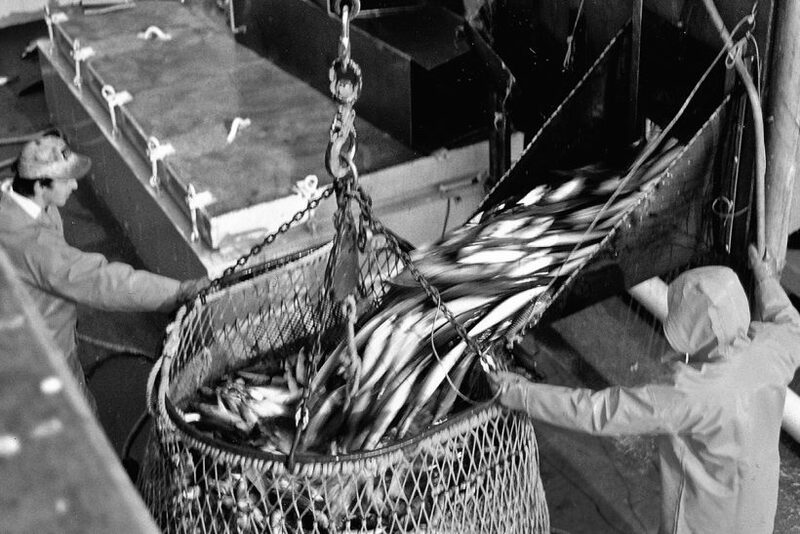 Mackerel being brailled ashore from the RSW tanks of the Fraserburgh pelagic vessel Serene. Skipper Ian Smith’s purser Alert III landing to an East European klondyking vessel. 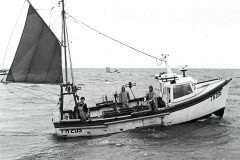 The midwater pair-trawler Scottish Maid brailling mackerel ashore. Eshcol, Coronella and Pathfinder anchored in Loch Broom. 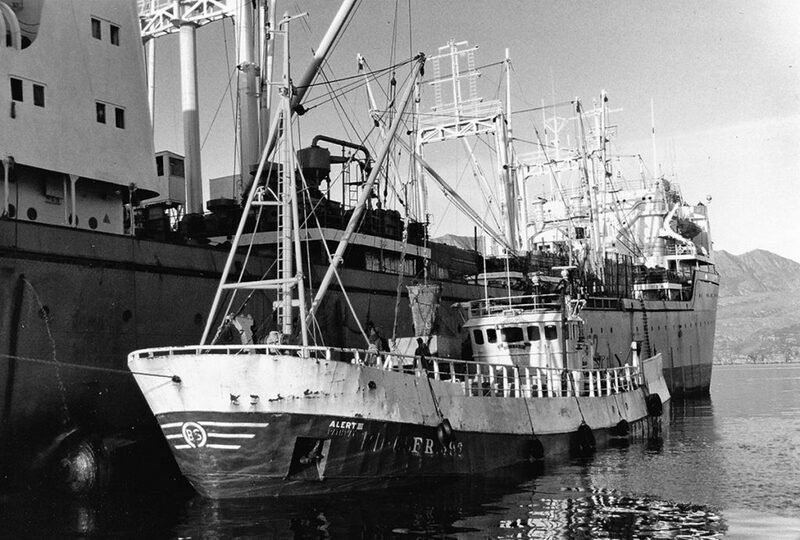 The Peterhead purse-seiner Vigilant, discharging mackerel to a Russian klondyker in Annat Bay in the late 1980s. 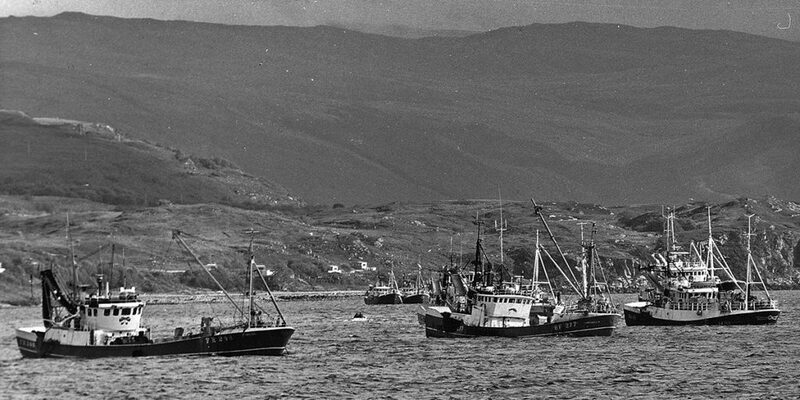 Pursers and midwater trawlers berthed at a busy Ullapool in the late 1970s include Eschol, Lorena, Annwood, Pathway, and Silvery Sea. 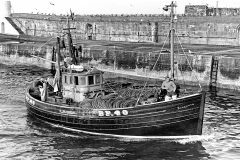 At the height of the mackerel season, around 100 factory ships would be anchored off Ullapool, serving a large fleet of vessels, ranging from 70ft wooden-hulled pair-trawlers, to the first, second and third generation of purser/trawlers, and for some years, large stern trawlers from Humberside. 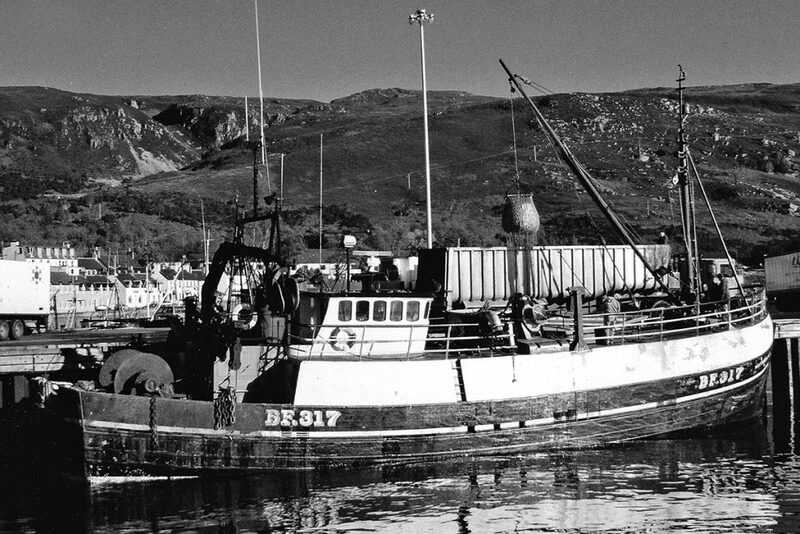 As the migration pattern of mackerel gradually moved to outside the Western Isles, the number of smaller pair-trawlers fishing from Ullapool on a regular seasonal basis, started to decrease. 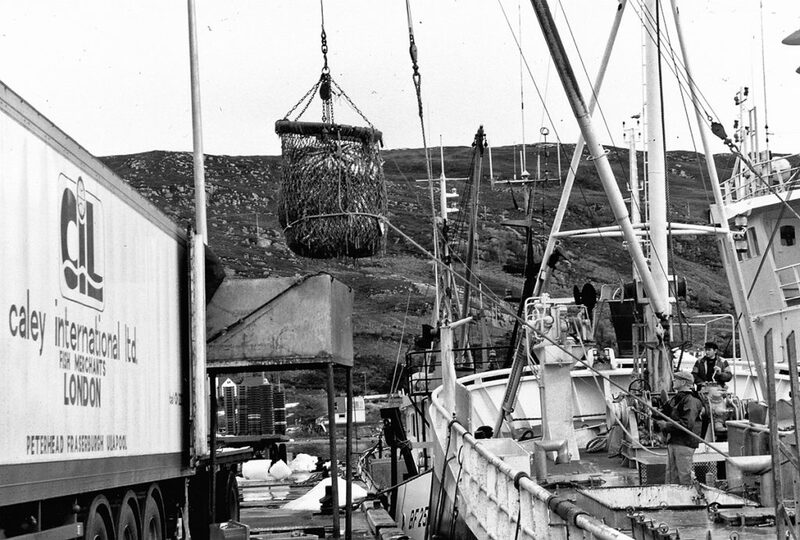 This drop in landing activity at Ullapool was further compounded by changes in marketing opportunities, together with the development of pelagic processing factories in northeast Scotland, Shetland, Killybegs and Norway/Denmark, which inevitably led to a marked change in landing patterns from the early 1990s onwards. Read more fishing nostalgia from Fishing News here.